I’ve had a blog for a long time and joined several fun swaps and trades, but never hosted anything on my own. 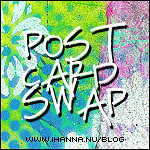 It is a Good Idea to join a swap (it gets your creative juices flowing!) and for me this will be a New Adventure for the new year! I’m very excited about this! Welcome everyone to join in and swap 10 postcards that you made and get 10 handmade in the mail! The rules are simple, but please read through them and follow them. Thanks! 1. Join the swap by sending me your information (full name, home address, e-mail and blog if you have one). If you’re not a regular visitor I’d love to know where you read about this swap, I’m a curious gal! Last sign up day is 7th of February 2010! 2. Make 10 handmade postcards any style (do collage, mixed media, print your own photos, print digital collages, create flat fabric art, alter an existing postcard in your paper stash (! ), paint with watercolors, draw mandalas, make postcards with a scrapbook style, embellished, painted, embroidered, etc)! Take photos, scan your finished result and we’ll make a flickr group for you to show us your creations later. 3. You will get 10 swap addresses via e-mail from me. After 8th of February that i will send you the 10 different addresses, those are your swap partners and you will send your postcards too these creative people. Connect, share and spread creativity into the world – that’s our slogan! There could be international swap partners too (I live in Sweden) because this swap is open for everyone! Send your postcards as is” plain or “hidden” in an envelope for protection (it’s up to you)! I’m new to this, let me know if you have any questions! Tell your friends! We need at least 10 people to sign up for this to work, but I know you wanna do it! Spread the word; bookmark it on Delicious or share on Twitter, write about the swap in your next blog post or add one of the cute buttons I’ve designed to your sidebar, linking to this post! Big thanks to you! There are more ways than I can think up to write down to make a simple (or elaborate) postcard by hand. I love making postcards and I’ve made quite a few! I will post some postcards inspiration in the following weeks to keep us all inspired. First I’ve found some links within this blog! Here are a few postcards I’ve written about through the years, just to get you inspired to start planning/thinking! Be crafty. Be social. Share the you of creativity with the world! Feel free to join in if you have the time, anything you make will be appreciated even if you’re a beginner! Getting some snail mail is fun, and when it’s handmade that is an extra treat! I’d love to get some messy art in my mail box any time! And I would love to see what you do, so don’t forget to scan or photograph your postcards! Maybe we could make a zine or a little book with the postcards too? We’ll see. I’m off to start making mine now! This entry was posted in A Creative Life, Paper Crafting and tagged first try, innovative ideas, postcard swap, swapping. Bookmark the permalink. love it! loving all the community created by #craftsocial! i’m in and will post on my blog too! Jag vill ocks? vara med. Men jag vet ju inte vart jag kommer bo i Australien.. Attans. Attans. Men om det kan vara hemligt vilka vykort jag f?tt till den 30 april n?r jag ?r hemma igen s? ?r jag l?ttpl?tt med! Puss saknar dig, och v?rldens finaste vykort ever som du skickade till mig! Tack. rootmix, how fun – a new visitor to my blog, yay! You’re welcome to join, your blog looks yummy! Homemade cards are just great, you just feel the creativity. This is right up my alley. I’m definitely in. Do I need to send you my infos or do you have everything needed for this? I’m in…email me and let me know what you need. Count me in Hanna, sounds like fun and daunting. One of my New Year’s resolution, try something new, learn something. Thank you girls for coming aboard our Postcard Ship and setting creative sails with me! Eh… hehe, so glad I took the leap to start this! We are already well over 10 – yay! Oh, yes, please! I do want to play!!! I’m in – I’ve emailed you and I’ll post about it on my blog! Bridget, I’ve gotten watercolor postcards and they were fine though not “perfect” when they arrived. Watercolor is such a beautiful medium, I love watercolors! This sounds like fun -I haven’t joined in a swap for ages. and I just love getting mail! Can I join in please? Hi I’m looking forward to this!! I have sent you my address. Fiona, yes yes yes! You can join, I just added your addy to the spreadsheet I created to keep track. Yay! Hello! I’d love to take part in this. I’ve never participated in any kind of swap before and I don’t usually show my “efforts” to anybody, but I’m going to approach 2010 as a year of adventure and try new things. I’ll email a couple of crafty friends and see if they want to join in too. Good luck everyone and happy crafting! I will send you my info in case you don’t have it handy, and I will be ready to send right on time! Is there still room for this? I’d love to send some goodies! Chris, I knew I could count on you! :-) Always. Jennie, I’ve been waiting for you all day! There is plenty of room for you! I’d love to play, count me in! I’m going to sign up. This will be a great challenge for me. I will now send you my info. Thanks for hosting this. It’s going to be fun!! I would love to play. Thanks for the great inspiration. Chris gave me the heads up for this, Hanna. I’m in too! I see swaps all the time and have never participated! I am excited! I found you through Julie Pritchard’s Blog! I’d love to play, too. This will be my first time. Do the ten postcards need to all be different, or can they be 10 of the same? lijkt me heel leuk om te doen. Please include my name in this beautiful swap . Count me in… found you through Michelle Ward’s blog… great idea and can’t wait! I’m a scaredy cat Hanna! I want to play but I’ve never made mail art before. Please count me in if you don’t have enough people on the last day. To be added to the postcard exchange you need to write me with your snail mail address, whole name etc. Please I need you to read the rules, then go to my contact page and join! Welcome everyone to join the swap! yeah! why not, I’d love to play!!! Count me in! It osunds like so much fun. I’d love to participate. I’m in a creative mood this weekend, now that my chest cold has departed. I think I’ll get started on making my postcards – right away! I’ll e-mail my details to you. What fun! This is much work and very expensiv on postage. I think 3 or 5 would have been much better. Just a thought, hope you don’t mind. What a great idea!!! I just sent you my info. I can’t wait to start making my postcards. This is going to be quite the lovely journey! How inspiring….and we all love getting surprises in the mail. I would love to share in the fun! I’ve never participated in a postcard swap…I usually just enjoy other people’s creativity, but why not share some of my own? This will be fun!! count me in! i’ll send my details to you. great idea!! Love this idea so much! I sent you my details and cannot wait to get started! I’m so excited! I just sent my information over to you. I’ve never participated in a swap before, and I’m totally geeking! Good for you Hanna, it will be fun! I signed up and am really looking forward to this! I got started on my cards yesterday! Thanks for hosting this swap! Woohoo, this sounds like a load of fun. 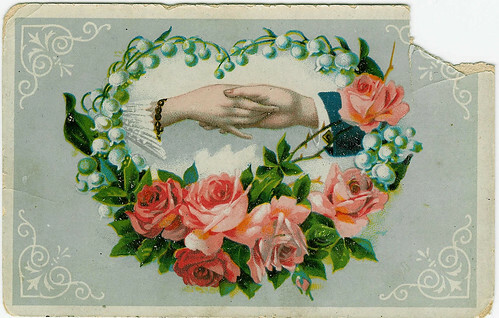 I’m off to make my cards and can’t wait to start checking my mailbox after Valentine Day! Thanx for hosting this, we have some brand new handmade paper just waiting for a project. Ive never done an art swap before.. so…..excited ! i am IN! This is great, Hanna. I love postcards…. they gives glim’s of other peoples life. out about the swap on facebook from Ewain! If it’s not too late, I’d love to join. I signed up! I just wanted to let you know I’ve completed 4 of my 10 postcards and I have posted photos of them on my blog. I’m new to mail art but I’m having lots of fun. This is my first swap project and I’m really excited!! Bummer I missed the swap. What a great idea!! I’ve made the postcards, but I can’t mail them because I don’t have addresses! I know I’m in the swap because I’ve received a few, but if you could resend the addresses, I’d really appreciate it. Thanks! Let me know if you ever need a fill in because I can whip up postcards pretty quick. SO sad I missed this! Rosalind, I’ve e-mailed you the addresses again and hope that you will receive that mail and send your cards out ASAP, people are waiting eagerly to get their postcards by now. Let me know that you got it! Thanks!